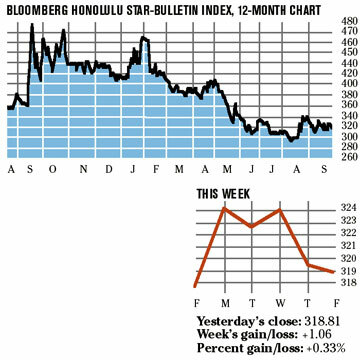 Mera Pharmaceuticals Inc. topped the Bloomberg Honolulu Star-Bulletin stock index this week with a 12.5 percent increase that far outstripped the other gainers for the week. But even that couldn't quite lift Mera to full-fledged penny stock status, leaving its price at 0.9 cents a share. In the year to date the company is down nearly 44 percent; over the last 12 months it is down 62.5 percent. 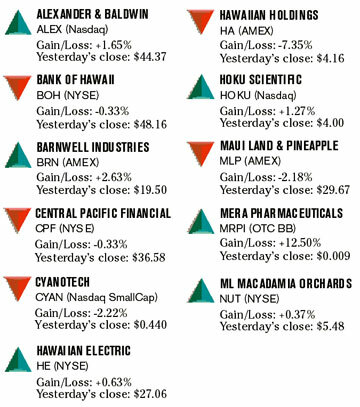 Barnwell Industries Inc. came in second with a 2.63 percent gain for the week, closing at $19.50 a share.